Who actually names their kid Jane Doe? As an introductory note to this review, I recognize with some dismay that the movies on this website which I review positively will likely never be seen or talked about. I always generate the most responses when bashing a film, but not a peep is heard when I have anything commendable to say. I believe this to be largely the nature of the beast—this is a bad movie website, after all. Furthermore, the movies about which I have the nicest things to say are often the ones that surprise me. A film like JANE DOE is wholly obscure to most readers unless they happened to catch it on television. Unless you are a frequent peruser of BIG LOTS video selection (and really, you should be), you will probably never come across this movie without going out of your way to find it. And if even if you did find it, there are hundreds of infinitely better movies for you to spend your time watching, so why bother with this one? For these reasons I have learned to abandon the prescriptive concept of giving “good” or “bad” reviews to films. Rather, I try to simply describe the film and my reaction to it. Nevertheless, I can’t help but feeling a little glum knowing that few people will ever experience JANE DOE—nor, in the grand scheme of things, should they. To say JANE DOE begins “media en res” is an understatement. A frantic Teri Hatcher is leaping out of bed and answering her phone and demanding to know where her son is being held hostage. She then promptly is equipping herself with sniper rifles, answering payphones, hacking into corporate computers, and ultimately running from the police after being framed as an assassin. And all that, of course, is just a setup for yet more espionage to come. I’ve occasionally wondered what it would be like to create a film totally devoid of exposition. The first ten minutes of JANE DOE comes close to that, and I find it surprisingly exhilarating. True, I have no idea who Jane’s kidnapped son is or who is manipulating Jane or who she is. But as the action races forward I can’t help but enjoy being totally lost. It simplifies things: all I can think about is what is currently happening to Jane. This happily keeps what happens next a surprise and what happened before irrelevant. Eventually the movie tries to catch up with itself to detrimental results. 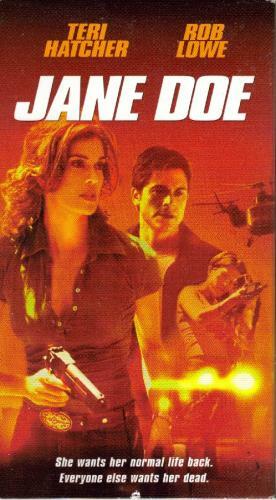 Once Jane resolves the hostage situation with her son the movie tries to explain just who her adversaries and allies are. Unfortunately, this cloak and dagger plotweaving is as inane as, well, just about any other Tom Clancy knockoff (…or genuine, for that matter). Lucky for me, in a way, the explanations were so convoluted that I didn’t quite catch on as to who was who, nor did I care to. Instead I absorbed the sublime absurdity of the film. Lines like: “(Punches villain in the gut) That’s for keeping me locked in a box!” are a sheer delight—especially when said box is never depicted nor described. What kind of box was it? Cardboard? JANE DOE is at its best when not doing what you expect a television movie to do—draw out the run time with cliché backstory so as to fit as many commercials as possible. The movie is totally empty, but thoroughly enjoyable.